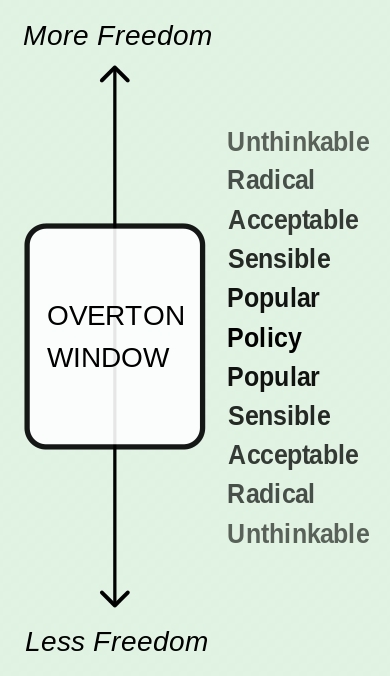 It seems like I've been hearing a lot recently about the "Overton Window" in politics. The idea is that there's a range of normal policy positions (within the window), which a politician can be adopt without being regarded as radical or extreme; and then there are radical or extreme positions, outside of the window. Over time, what is within the window can change. Gay marriage, for example, was outside of the window in U.S. politics in the 1980s, then entered the window in the 1990s or early 2000s. A common thought is that one way to move the window is to prominently voice a position so extreme that a somewhat less extreme position seems moderate in comparison, and perhaps enters the window. After Bernie Sanders starts saying "free college education for everyone! ", maybe "only" offering $10,000 toward every student's tuition no longer seems extreme. Still, the idea has some theoretical appeal. Might it capture some of the dynamics in philosophy? For it to work, first we'd need some sense of what positions qualify as extreme and what positions qualify as moderate in a philosophical cultural context. Then we'd need some way of measuring (through citations?) 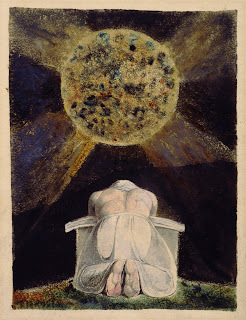 the increasing visibility of an extreme position and see if that opens up "moderate" philosophers to positions that they might previously have regarded as too extreme. Here's one possibility: Panpsychism is the view that everything in the universe is conscious, even elementary particles. Generally, it's regarded as an extreme position. However, it has recently been gaining visibility. If the Overton Window idea is correct, then we might expect some formerly "extreme" positions in that direction, but not as extreme as panpsychism, to come to seem less extreme or maybe even moderate. Hmmmmm. I'm not sure it's so. A couple of obvious candidates are group consciousness and plant cognition. These would seem to be less extreme positions in the same direction as panpsychism, since instead of ascribing mind or consciousness to everything, they extend it to a only limited range of things that aren't usually regarded as having mental lives. If the Overton Window idea is right, then, given the increasing visibility of radical panpsychism, group consciousness and plant cognition will come to seem less extreme than they previously were. Hard to tell if that's true. Both positions are probably more popular now than they were 15 years ago (in academic Anglophone philosophy), but they'd still probably be considered extreme. Eh. You know what? My heart isn't in it. I'm too bummed about the Glenn Beck thing. I wanted this to be an idea with a more solid scholarly foundation. Okay, I was all set to put up a blog post today about whether we can aesthetically appreciate evil artworks like Leni Riefenstahl's Nazi propaganda film Triumph of the Will. But my head is spinning with jetlag, and it's such a difficult issue to talk about well that I want to be sure that I get it just right. So I think I'd better refrain on the final revisions of that post until my head feels less cloudy. Regular visitors to The Splintered Mind will know that I try to post at least one thing a week, but I guess I'll have to give this week a pass. Today marks the third year since the death of my father, Kirkland Gable. (Some memories of him here.) I now better understand than I once did why the ancient Confucian tradition recommends three years' mourning for one's parents. To my surprise -- since we had only been in contact about once a month before his death -- I find myself almost every day still thinking about his absence. My father spent the final twenty years of his life severely disabled and often bedridden. Among his many maladies, he suffered from severe Chronic Regional Pain Syndrome in one foot, which meant that he was in constant pain which would be seriously aggravated, sometimes for weeks, from even mild exertion, such as ten minutes' walking, or jostling the foot too much during sleep or while in a wheelchair. It was, I believe, ultimately the CRiPS that killed him, through the side effects of long-term narcotics and the bodily harm from spending years almost immobile in bed. I have often wished, during his final years, that we could have freed him from his horrible bed. I've tried this in imagination many times, attempting to write it up as a science fiction story. But the story never seems to come out right. Today, instead of the story I can't yet write, let me discuss a technological innovation that I think would be interesting for people who are bedridden. The core idea is simple and would be easy to implement. Probably, it is already being implemented somewhere. (Links and info welcome!) Equip an able-bodied volunteer, the "Host", with a camera above each eye and a microphone by each ear. Equip the bedridden person, the "Rider", with VR gear that immersively presents these audiovisual stimuli to Rider's eyes and ears. Also equip Rider with a microphone to speak with Host, directly into Host's ear. Now send Host on a trip. During this trip, let Host be guided mainly by Rider's expressed desires, going where Rider wants, looking where Rider wants to look, stopping and listening where Rider wants to stop and listen. Unlike VR tours as they currently exist, Host can interact with and alter the environment in real time. Rider could have Host lift a flower and turn it in their hands, then cast the flower into a stream and watch it drift away. Host could purchase goods or services on Rider's behalf. Host could conduct a conversation through Rider, interacting with locals by having Rider speak Host's words verbatim. A more ambitious Host-Rider setup would employ VR gloves. As I imagine it, Rider and Host wear matching gloves. These gloves are synchronized to move in exactly the same way -- of course with quick escape overrides and perhaps with Rider's motions damped down to prevent overextension or bumping into unseen obstacles near the bed. This would take some excellent technological chicanery with good motion tracking (Nintendo Wii, improved) and some way of restricting or guiding the movements of the gloves on each end, perhaps using magnetic fields, so that when Rider wants to move a hand on vector W and Host wants to move it on vector V, the result is some compromise vector (barring safety override). An intuitive collaboration would be necessary between Rider and Host, and gentle, predictable movements. With practice, I think it would not be unfeasible, at least in safe and simple environments, for Rider to feel as though it is almost their hands that are moving in the virtual environment. This could be further enhanced with tactile feedback -- that is, if pressure sensors in Host's gloves communicated with actuators in Rider's gloves that exerted corresponding pressures in corresponding locations. A final, expensive, risky, and much more conjectural step here -- probably a step too far -- would involve equipping Host and Rider with helmets with brain-imaging technology and the capacity for Transcranial Magnetic Stimulation (or some other ability to directly stimulate or suppress brain activity). For example, for a fuller tactile experience, activity in Host's primary somatosensory cortex could be tracked, and a vague, faint echo of it could be stimulated in matching areas in Rider's cortex. One wouldn't want too much synchrony, and anyhow brains differ somewhat in their organizational structure, even in fairly similarly structured regions like somatosensory cortex. Also, of course, you wouldn't want much motor signal going down through efferent nerves into the Rider's body, making Rider move around in the bed. Also, current brain imaging technologies, even if we imagine portable versions of them, wouldn't be spatiotemporally sharp enough to do a proper job of it. But still, a dim, vague signal might be very suggestive for an otherwise well-harmonized, collaborative Host and Rider, in a rich environmental context with very clear cues and expectations. I won't conjecture about, say, attempting to match activity in emotional regions or associative cortex. Conjecturing about a high degree of match between different people's brains is both neurophysiologically unrealistic and possibly too threatening to the autonomy of Host and Rider -- though of course there are dark, interesting, far-future science-fictional possibilities there. Let's bracket, then, this last conjectural step with brain imaging and brain stimulation, and focus just on the VR experience with audiovisual input, shadowing, and matching-motion gloves -- all in a positive, harmonious, and non-exploitative relationship with a host. I think that would be pretty cool, and near- to medium-term technologically achievable. If it plays out right, it might give some bedridden people a chance to explore the world beyond their bed in a much more vivid, engaging, and interactive manner. My father was both a psychologist and an inventor. In 1995, when he was first diagnosed with cancer, he had been wanting to go to Hong Kong, and he had to cancel the trip to attempt a bone marrow transplant. He never did make it to Hong Kong. I wish I could bring him back, build some of this technology with him, then take him there. 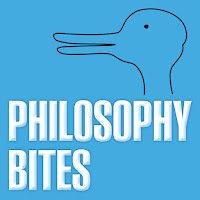 Yesterday, Philosophy Bites released a brief podcast interview of me on skepticism. Listening to the interview now, I feel that I didn't frame my project as well as I might have, so I'll add a few remarks here. I want to think about what grounds we might have for a non-trivial sliver of radically skeptical doubt. There is, in my mind, an important difference between, for example, "brain-in-a-vat" skepticism and dream skepticism. Brain-in-a-vat skepticism asks you how you know that genius alien neuroscientists didn't remove your brain last night while you were sleeping, drop it into a vat, and start feeding it stimuli as though you were having a normal day. Dream skepticism asks how you know that you are not currently dreaming. The difference is this: There are no grounds for thinking that there's any but an extremely remote chance that you have been envatted, while there are some reasonable grounds for thinking there's a non-trivial sliver of a chance that you are presently dreaming. It's crucial here to recognize the role played by theories that are probably wrong. It is, I think, probably wrong that people often have sensory experiences just like waking experiences when they sleep. Dreams are, in my view, always sketchy or even imagistic, rather than quasi-sensory with rich realistic detail. However, I'm hardly certain of this theory, and some prominent dream theorists argue that dream experiences are often highly realistic or even phenomenologically indistinguishable from waking life (e.g. Revonsuo 1995; Hobson, Pace-Schott & Stickgold 2000; Windt 2010). Contingently upon accepting that latter view, it seems to me that I ought to reasonably have some doubt about my current state. Maybe this now is one of those highly realistic dreams. The idea here is that there are grounds for accepting, as a live possibility, a theoretical view from which it seems to follow that I might be radically wrong about my current situation. I don't prefer that theoretical view; but neither can I reject it with high certainty. It is thus reasonable for me to reserve a non-trivial sliver of doubt about my current wakefulness. I would argue similarly with respect to two other skeptical possibilities: the idea that we are Artificial Intelligences living in a simulated world, and a somewhat less familiar form of skepticism I call "cosmological skepticism". In both cases, there are grounds, I think, for treating as a live possibility theories that, while probably not correct, would, if correct, imply that you might easily be radically wrong in many of your ordinary beliefs. In concluding the interview, I also make an empirical conjecture: that seriously entertaining radically skeptical possibilities has the psychological effect of reducing dogmatic self-confidence and increasing tolerance, even regarding non-skeptical possibilities. I hope to more fully explore this in a future post. One thing I like about this passage is that it assumes love and reverence for one's family as a given, rather than as a special achievement, portraying moral development as a matter of extending that natural love and reverence to new targets. 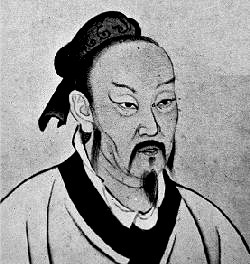 Similarly, in passage 1A7, Mengzi notes the kindness that the vicious ruler King Xuan exhibits in saving a frightened ox from slaughter, and he urges King Xuan to extend similar kindness to the people of his kingdom. Mengzi says that such extension is a matter of "weighing" things correctly -- a matter of treating similar things similarly and not overvaluing what merely happens to be nearby. Contrast this approach with "The Golden Rule": "Do unto others as you would have others do unto you". Contrast it also with the common advice to imagine yourself in someone else's shoes. Golden Rule / others' shoes advice assumes self-interest as the starting point. While Mengzian extension starts by assuming that people are already concerned about nearby others, and takes the developmental or cognitive challenge to be extending your concern beyond a narrow circle, The Golden Rule / others' shoes thinking starts by assuming egoistic self-interest, and takes the developmental or cognitive challenge to be generalizing beyond one's own self-interest. (1.) If I were in the situation of Person X, I would want to be treated according to Principle P. (2.) Golden Rule: Do unto others as you would have others do unto you. (3.) I will treat the person according to Principle P. (1.) I care about Person X and want to treat them well. (2.) Person Y, though perhaps more distant, is relevantly similar. (3.) Therefore, I should also treat Person Y well. There will be other more careful and detailed formulations, but this simple sketch captures, I hope, how radically different these two ways of modeling moral cognition are. Mengzian extension models general moral concern on the natural concern we already have for those nearby, while Golden Rule / others' shoes thinking models general moral concern on concern for oneself. I like Mengzian extension better, for three reasons. First, Mengzian extension is more psychologically plausible. People do, naturally, have concern for and compassion for others around them. Explicit exhortations aren't necessary to bring this about. This natural concern for and compassion for others is likely the main seed from which mature moral cognition grows. Our moral reactions to vivid, nearby cases become the bases for more general principles and policies. Second, Mengzian extension is less ambitious -- in a good way. The Golden Rule imagines a leap from self-interest to generalized good treatment of others. The Golden Rule is sometimes excellent and helpful advice, perhaps especially for people who are already concerned about others and thinking about how to implement that concern. But Mengzian extension has the advantage of starting the cognitive project much nearer the target, involving less of a leap, since it only moves from natural concern about nearby cases to similar treatment of relevantly similar but more distant cases. Although both Mengzi and Rousseau endorse the motto that "human nature is good", and have views that are similar in important ways (as I explore here), this is one difference between them. In both Emile and Discourse on Inequality, Rousseau emphasizes self-concern as the starting point, treating natural pity or compassion for others as secondary and derivative. He endorses the foundational importance of the Golden Rule, concluding that "Love of men derived from love of self is the principle of human justice" (Emile, trans. Bloom, p. 235). This difference between Mengzi and Rousseau does not, I think, reflect a general cultural difference between ancient China and the West. Kongzi (Confucius), for example, endorses something like the Golden Rule: "Do not impose on others what you yourself do not desire" (15.24, Slingerland trans.) Mozi and Xunzi, also writing in period, imagine people acting mostly or entirely selfishly, until society artificially imposes regulations upon us, and so they cannot see Mengzian extension as the core of moral development. (However, also see Mozi's argument for impartial concern that starts by assuming that one is concerned for one's parents [ch. 16].) The extension approach is specifically Mengzian rather than generally Chinese. I'm proud of what I've managed to write in the past year. May 2018 be similarly fruitful! "Rationalization in moral and philosophical thought" (with Jonathan Ellis), in Moral Inferences, ed. J.-F. Bonnefon and B. Tremoliere (Psychology Press). "1% skepticism", Noûs, 51, 271-290. "Women in philosophy: Quantitative analyses of prevalence, visibility, and generational change" (with Carolyn Jennings), Public Affairs Quarterly, 31, 83-105. "The insularity of Anglophone philosophy: Quantitative analyses" (with Linus Ta-Lun Huang, Andrew Higgins, and Ivan Cabrera Gonzalez, Philosophical Papers. "Death, self, and oneness in the incomprehensible Zhuangzi", in P.J. Ivanhoe, O. Flanagan, R. Harrison, H. Sarkissian, and E. Schwitzgebel, eds., Oneness in Philosophy, Religion, and Psychology (Columbia University Press). "What happens to democracy when the experts can’t be both factual and balanced? ", Los Angeles Times (Jan 27). "Does it matter if the Passover story is literally true? ", Los Angeles Times (Apr 9). "Two-week lesson plan on lynching, the Milgram experiments, and the question of whether 'human nature is good'", Deviant Philosopher (May 19). "Dreidel: A seemingly foolish game that contains the moral world in miniature", Los Angeles Times (Dec 12). "Consciousness, idealism, and skepticism: Reflections on Jay Garfield’s Engaging Buddhism", Sophia (forthcoming). Oneness in philosophy, religion, and psychology (with P.J. Ivanhoe, O. Flanagan, R. Harrison, and H. Sarkissian), Columbia University Press (forthcoming). "The unskilled Zhuangzi: Big and useless, and not so good at catching rats"
"The pragmatic metaphysics of belief". "THE TURING MACHINES OF BABEL", Apex Magazine, issue 98(2). "Little /^^^\&-", Clarkesworld, issue 132(2). - translated into Vietnamese for TẠP CHÍ KHOA HỌC VIỄN TƯỞNG VIỆT NAM, issue 13, 37-60. - collected in Web's Best Science Fiction #1, Featured Futures. Against charity in the history of philosophy (Jan 8). The Happy-Coincidence Defense and the Most-I-Can-Do Sweet Spot (Apr 27). How to build an immaterial computer (Sep 25). Truth, dare, and wonder (Oct 12). Philosophy undergraduate majors aren't very Black, but neither are they as White as you might have thought (Dec 21). Interview with author Eric Schwitzgebel, Apex Magazine, Jul 12 (concerning my story THE TURING MACHINES OF BABEL). Eric Schwitzgebel on introspection, AI, and consciousness, Singularity Bros, Nov 13. Eric Schwitzgebel on weird ideas and opaque minds, Rationally Speaking podcast, Oct 29.